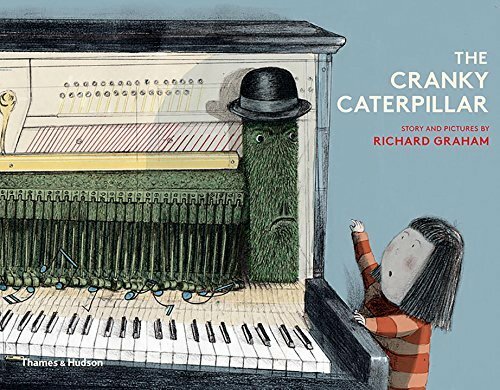 Either of these lessons could serve as the premise of the new hardcover picture book by author/illustrator Richard Graham called The Cranky Caterpillar, a book about a caterpillar trapped inside a piano who has been playing the same tune for a very long time. In the book, a girl named Ezra discovers the unsmiling caterpillar inside an old upright piano, playing a discordant tune with its many feet. Because the tune makes everyone who hears it (including the caterpillar) feel down and blue, Ezra takes it upon herself to cheer the droopy-faced caterpillar up. She tries offering the caterpillar a scrumptious meal, taking him outside for some fresh air, and even buying him a new hat to spice things up. But nothing works, until she resorts to some tried-and-true methods that are sure to bring a smile to the gloomiest face. This is a cute little book about the importance of socializing, the power of friendship, and why it’s so crucial to be willing to change your mind (or in this case, your tune!). Mr. Graham’s prose is simple and realistic, and just natural enough to make readers believe that they are in on the plan to cheer up the cranky caterpillar. His use of flat grays, blacks and greens lend to the illusion of an environment that’s just a little too stifled for comfort. His illustration of the caterpillar as part of the hammers inside a piano is reminiscent of “the creature from the black lagoon”…only this creature is adorably sad and in need of the biggest hug young Ezra can dish out. Use this book in pre-school or early elementary classrooms to open discussions about sadness, boredom, and just what happens when you change your mind. 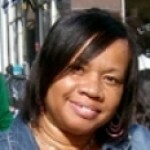 It can also be used to emphasize the power and importance of friendship, socializing, and having fun with others.